This book is the final report from the World Bank's SEA pilot program. It presents the findings and recommendations of the evaluation of the Pilot Program which comprised six SEA pilots on sector reforms in Kenya, Malawi, Sierra Leone, West Africa, Bangladesh and China. Apart from enhancing environmental integration in the pilot cases the pilot program has influenced the new World Bank Environment Strategy and World Bank approaches to environmental integration in sector reforms. The book shows that sector reforms often are inherently political processes driven by strong economic interests. In such a context traditional technically oriented environmental assessments focusing on estimating impacts are often of little relevance. 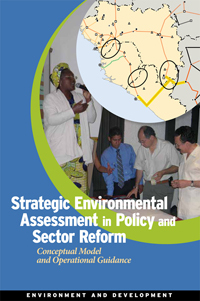 The book strongly argues that effective environmental assessment in policy and sector reform should focus on analyzing and strengthening the institutions and governance frameworks for managing key environmental priorities. In particular SEA should strive to strengthen constituencies that can demand improved environmental governance and a system to hold policy makers accountable for their decisions.